The one that you see featured above is titled "Joe-Pa" who was the famous coach of the Penn State football team. The artist was Rebecca Pollard Myers and the sponsor was the Harristown Development Corporation. If you're a Penn State fan, it's a must-see in Swatara Township, Harrisburg. What is really cool is that when you visit their web site you can read about the artists who have participated to learn more about them and the artistic cow that they created. To date, over 10,000 artists have participated and they have raised over $30 million dollars that has been donated to non-profit charities around the world. The cow statue that you see above is called the "Cattle of Gettysburg" and it's located in Swatara Township, Harrisburg. The design on this one features the Union and Confederate Army's flags. As you can see, the design covers the cow from head-to-toe. The artist was Victoria Goodhart and it was sponsored by Boyds Bear Country. The one that you see featured above is titled "Arches Over The River" and it features a Susquehanna River Bridges design. The artist for this one was Darlene Miller and the sponsor was Harrisburg Regional Chamber & Capital Region Economic Development Corporation. This one is located in Swatara Township, Harrisburg. As you are traveling all around the world make sure you check out the Cow Parade to see if you can spot one! I know here in Pennsylvania, we can often spot them at local area tourist attractions. When my husband and I see them, we take photos and document their location. We then get online and research who the artist was and the sponsoring company. Hopefully one day we will have enough to start an entire album of all of our cow spottings from around the world. 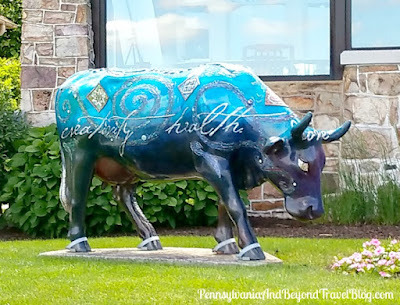 The Recy-Cow Artistic Cow Statue is part of the Cow Parade too! This particular one was spotted on Linglestown Road in Harrisburg, in front of the Just Cabinets office building. As you can see, it was decorated using recycled materials. Added in 2018: We located the Mootivational Cow sitting in front of the Anchor Commercial Realty building on North Front Street in Wormleysburg. The talented artist was Joanne P. Cassaro and to-date, it's one of my husband's favorites in the Cow Parade. Added in 2019. We located the Space Cow sitting in front of the Steelton Municipal Building in Steelton (Harrisburg). You can learn more about the Space Cow by visiting our separate post here on the blog. Love that outer space theme on that one! We love checking out street art, wall murals and other unique pieces of art. 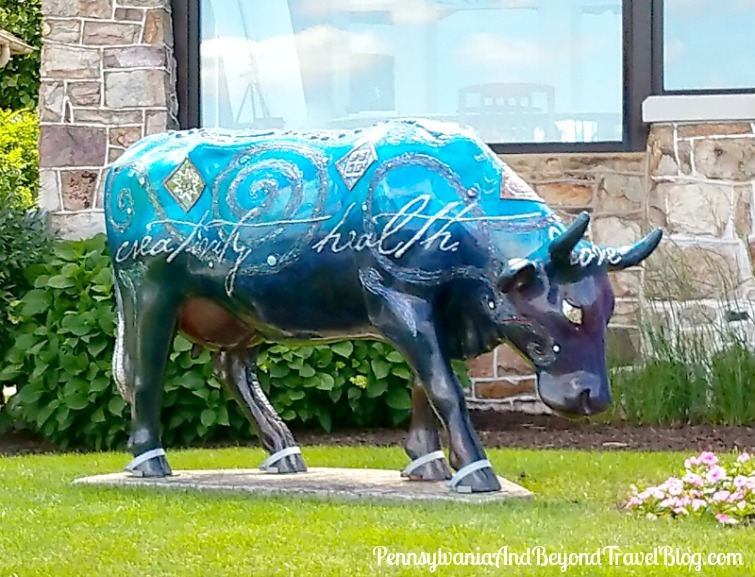 Have you ever seen any of the bovines that are part of the Cow Parade? If so, where did you see one?